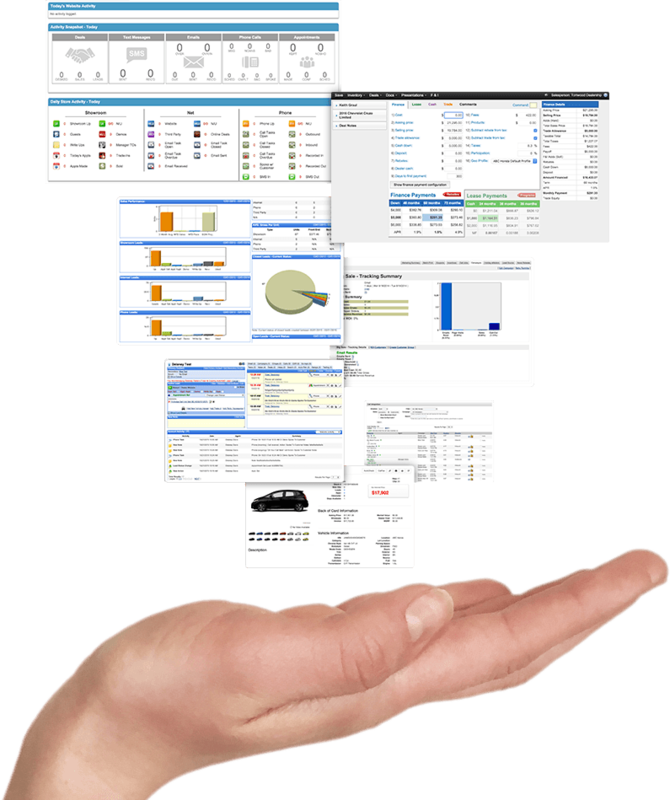 Automotive CRM that just makes sense. "The training and support is spectacular. It's a product that just keeps getting better and improving to make it easier for our company to grow." 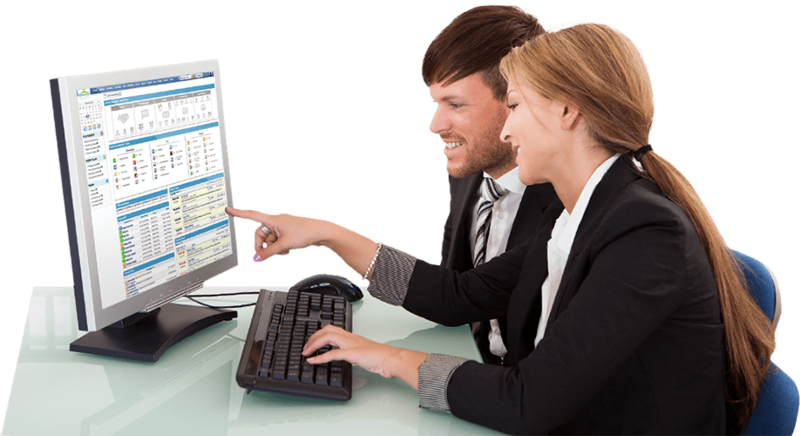 "DealerPeak Automotive CRM is part of our day-to-day operation. We couldn't function without it. Our sales people love it." Easy to use. Built for your dealership. For an Automotive CRM to work and help your dealership grow, it has to be easy to use for your entire team and an integral part of your sales and service culture. That's why the DealerPeak Automotive CRM is built to be picked up fast, and customized to fit the way you want to do business. Expect all the functionality, features, and integrations, with extras that other providers can't deliver, like a "Roles Based" architecture that makes it highly effective for BDC teams, e-commerce directors, sales, and every level of management. All backed up by phenomenal coaching and personalized support. Your business is unique. Your Automotive CRM should be too. It Exists. A powerful, simple CRM. Everyone from your "old school" car guys to your most computer savvy staff will appreciate the ridiculously non-intimidating screens. New users can start off with a very simple system and then move up to the full interface with more advanced features when they're ready. Get full buy-in and support from your BDC/CRC department with an Automotive CRM that accommodates its unique culture. From automated and customized lead follow-up processes, to real-time reporting, your Automotive CRM and BDC/CRC will be fast friends. Run all your stores on the same Automotive CRM and achieve a lower cost of ownership with a framework that is unique to the industry. 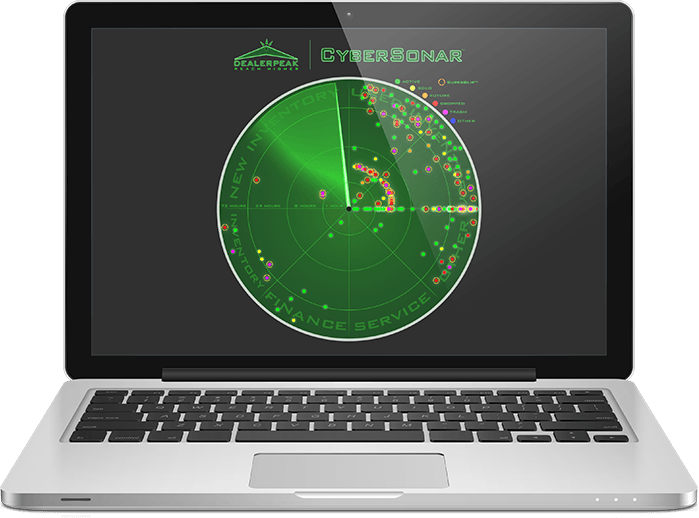 Your multi-location, multi-line company can view reporting and manage people through any combination of stores or all stores at once. All the best features in one unified system. Full functionality without having to sync data or refresh screens allows you to sell efficiently on the go. Each user sees exactly what’s needed to power performance, while advanced user permissions are customized to your operations. Employees work smarter and faster with personalized workflows that get them where they need to be in record time. Driver’s license scanning and text and phone integration make it easier to get information into your Automotive CRM for better follow-up and measurement. Act now when it matters. Instant emails and text alerts let you act on information when it matters, not days later. 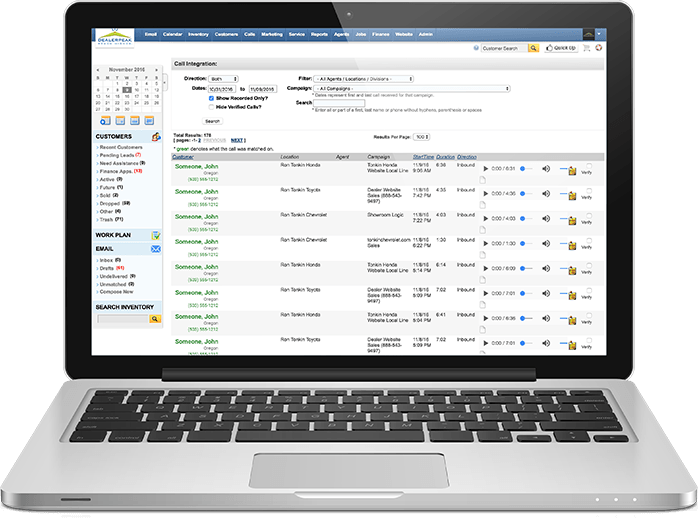 Automatically import valuable DMS data, including sales, service repair orders, and inventory. Real-time process monitoring, activity-based opportunities, and lead ROI reporting drives more accountability and insights to improve your success. Get maximum impact from your new Automotive CRM with coaches who work to understand your culture and proactively reach out with utilization tips and tricks. Your lot at your fingertips. Full inventory integration speeds your work, and is essential when recommending a vehicle to customers or adding vehicles to leads. Lock in more service appointments by following up at the right time with the right offer. Tools to rise above the rest. Enhance your Automotive CRM with unique and highly effective tools designed to increase lead-awareness, improve communications, and uncover selling opportunities. It's everything you're looking for in one unified approach. The result? Fewer vendors. Fewer problems. Better dealers. This game-changing tool allows you to view the activity of your customers as they surf your website, and gather valuable statistics like customer name, where they came from, what they're looking at, and their current status in your Automotive CRM. It's one-of-a-kind, lead-focused awareness that identifies actionable selling opportunities based on customer-specific website activity. 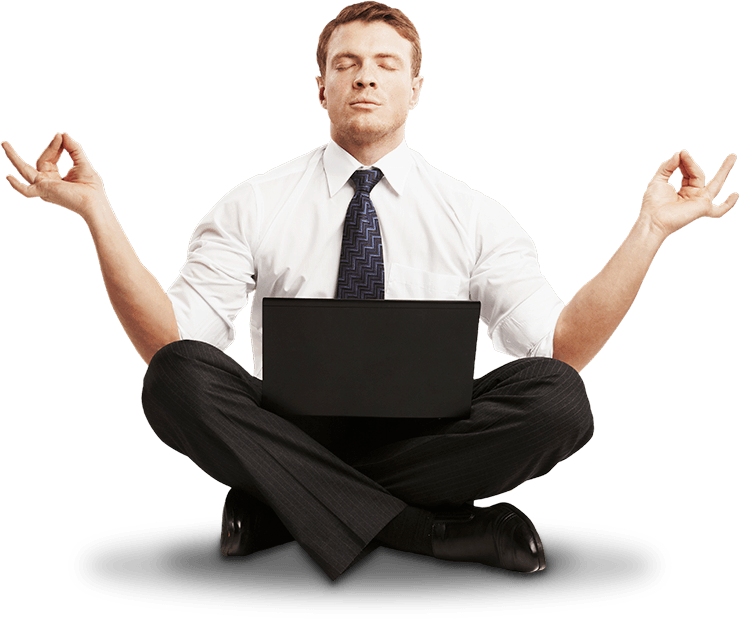 Phone skills and handling are among the most critical aspects of an effective sales operation. With call recording, you can track call times, duration, and even listen to each call. 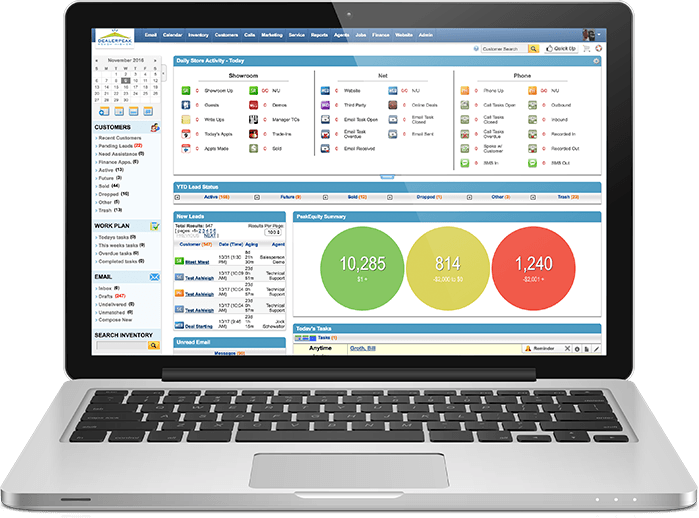 Advanced reporting delivers the metrics managers need to ensure call tasks are completed and are of high quality. Texting is the preferred mode of communication for a huge segment of customers. 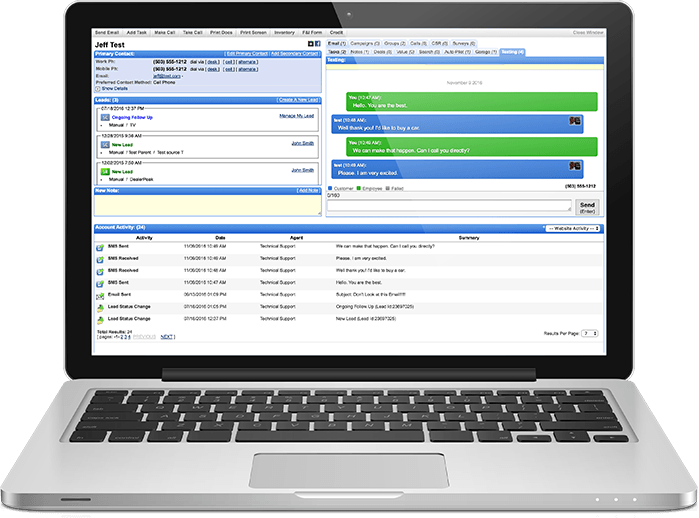 Make it more efficient and trackable with the ability to send and receive texts directly from your Automotive CRM. All inbound and outbound texting is captured and easily reviewed by your managers. Unlock the selling potential of your Automotive CRM with fully integrated equity mining that helps you identify and contact sold and service customers with equity in their vehicles. Unique to Dealerpeak, you can even target used customers and build exact repurchase quotes from used vehicles in your inventory. 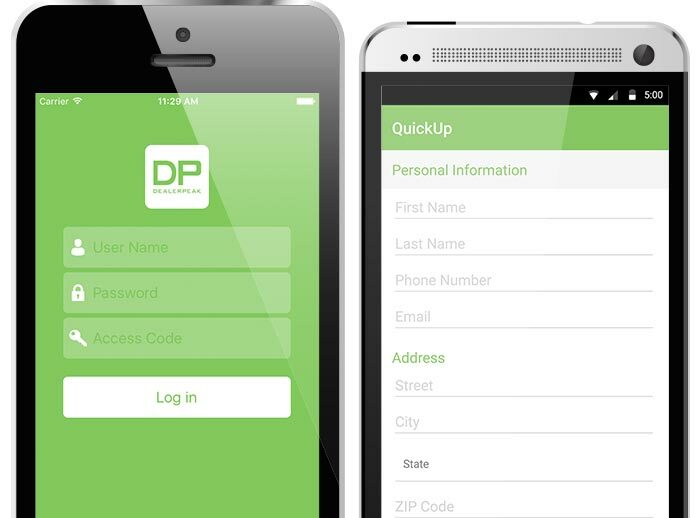 Efficiently work quickups with our integrated mobile app for an Android and iPhone. It allows you to enter customer information, see customer history, scan a trade-in VIN, and associate a vehicle with a customer - all at anytime and from anywhere.